We have signed off the Approval to the Print Proof Copy of FORTH-Me3, so that now goes to Production and Marketing. Within a week or so we should be able to reveal the Cover Art and begin to get things moving. Official release though will probably be January 2013. 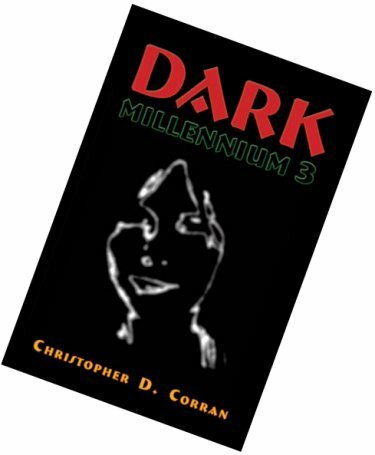 Sales of DARK-Millennium 3 should begin to rise after the imminent release of FORTH-Millennium 3. As usual, negotiations over the Cover Art were complicated by the fact the Graphic Artists who do the design and layout work on each book…have not read the book! They work from briefs provided by the author. This is true at each stage of publication and promotion. The Cover Art is based on a story synopsis. The Back Cover text is based on a story synopsis. The Press Release is based on a story synopsis. The Video Release Voice Over is based on the Press Release text. All of this text input is provided by the author, who has to have some idea of where he wants the book to be pitched, at each level of production, promotion and marketing. For instance, the text on the back cover of the book, the ‘blurb’, so to speak, is more pointed and graphic in its layout than the Enhanced Press Release, which contains an image of the book, an image of the author, an outline of the book’s Theme and a link to a YouTube Video Trailer. They each have something to do with each other but the technical construction and purpose of each is subtly different. The demands in producing FORTH-Me3 were as unique as the book. The demands of DARK-Me3 were very subtle, despite the stark look of the cover. We felt it was vital not to tell in DARK-Me3 what FORTH-Me3 was to be about. The two books are companions in very special ways. DARK-Millennium 3 laid out the concepts of Life After Death, the Rules of Engagement, which are then developed throughout the rest of the trilogy. The book feels nice in the hands – very black and glossy. Some will find it to be a ‘spooky read’. We have been looking at ways to publish it more widely, including at New Book Journal, which we have linked to at right. New Book Journal has also been a source of an interesting Network that was designed by the website author, Raymond Klesc. We will look more at that too. For now, it’s important to get maximum exposure for the video and to promote Book Sales online. It’s all sales ,regardless whether it be Print Copy or e-Book Edition. In the back of the mind also is the Beijing Book Expo. That hangs as an exciting and promising show…but news will probably be a couple of weeks coming. It takes a while for the folk from Strategic to get their feet back on the ground after each trip away. But Beijing remains a very major Expo and China is a potential market of massive interest. Progress in marketing DARK-Millennium 3 has been multi-layered throughout August. For some reason, when the Video Trailer Press Release went out to the industry target fields I had nominated, a copy of the PDF embedded Video was not also sent to me. I had previously approved the actual video proof copy. It was only when I queried the delay that the publisher realised my drop copy of the Press Release had been overlooked. I would have reported that here earlier had my copy been sent. Besides that, good news was that the Multi-Company purchase deal in Taiwan, which was to sell 500 books including DARK-Millennium 3, was with eight companies, rather than the original five of which I had been informed. These sales are automatically dealing with the e-Book Editions of the books sold but will ultimately include Online Sales of Print Copy, particularly in the event Online sales of e-Book Editions warrant the further marketing and printing effort. In addition to these successes in Taiwan, SBG is promoting its Author List at the Beijing Expo from August 31 through September 4. We hope and expect DARK will be among some similar deal there. Chinese Translation: In any case, DARK-Millennium 3 was translated into Chinese (Mandarin) some time back because of the immense potantial market represented by the 1.2 Billion Population of China, a significant proportion of the World Demographic. Progress on DARK-Millennium 3 continues. The e-Book has been out since April and DARK was among hundreds of books sold, in both the Print Copy and e-Book, to five companies in Taiwan. They included two public Libraries and several IT/Telephone companies. Now we are re-releasing our Press Release but this will be a revised and updated Video Press Release and SBG will select and target specific groups also. The facebook page has been active, while I did neglect this DARK Me3 page. We are beginning to get some traction on the ground. Because DARK-Millennium 3 was already translated into Chinese, we hope for some penetration at the Beijing Show in August. The Show Page for Beijing, also translated into Chinese, is already arranged. The Video Press Release is interesting. We have slightly revised the focus of the text but we are going with SBG suggestion to incorporate a video clip actually within the PDF PR, which will be directly linked to the video. That can also be posted to YouTube and other positions, such as this Blog and in facebook. Everything is an option!! The fee for converting DARK-Millennium 3 to the Digital Edition has been paid. This will see it available in formats suitable for Amazon Kindle, Nook, iPad and others such as cellphones and smartphones. All these matters are important. The moment we have the Bulk Book Buy in hand, plus the e-Book available Online – it will be time for a major marketing push. For now, hasten slowly is the word. But the pieces are falling in place for a big year. The book will also be available at every major Book Expo globally throughout 2011. We have made the Book Purchase, in this case for 75 copies, and wait now for them to be delivered. That will likely take a month, possibly more, for delivery. Other things are in train. We are working on a number of initiatives but they do need to be kept low-key until two waypoints are accomplished. We need to have the printed books before firing up any Local Market interest. We need the e-Book edition to be available so as to fully benefit from any spin-off interest generated by any and all the interesting things that we can do. The Artwork for the book has been released. Book sales should commence in about two weeks. It takes that long for the site development to be finalised and promulgated to the Web via the Publisher’s site. It’s interesting how the graphics development works. The publisher assured me my original artwork would not pass the Printing Process. We struggled with that and ended with the existing image. They suggested several images which we found unsatisfactory. These included a detail from an ancient Greek vase and others which were off-concept from our point of view. The result was basically that we insisted some form of the original concept art be used and what we got is this above. The lesson is that authors have to work with the publisher all the way to the door and out to the street. Just cannot walk away. The book feels nice in the hands – very black and glossy. 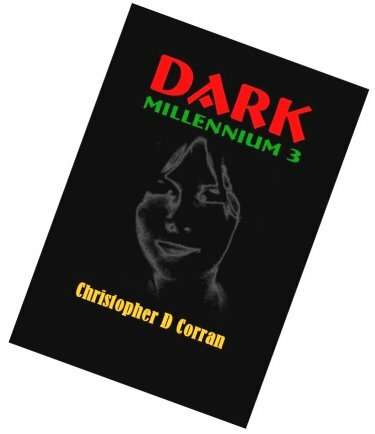 DARK – Millennium 3 has been released to Sales and Marketing. This does not mean the book is on sale yet (I have a copy). They will be in touch in about a week with the address of the Author/Book page on their website. There will also be wheeling and dealing as regards my purchasing copies of the book for local distribution and sales. That will entail a personal cash outlay at a bad time. During the recent ‘weather events’, in which we had 26 inches of rain in December and a further eight inches by 9 am today, 11 January, the system here took a technical hit! Fried! Today the Publisher graciously forwarded a digital copy of the Final Draft of the book, which I had lost along with the last computer and the attached backup system. Replacing the computer and peripherals set me back about 6 or $800 Ouch! Have to go now. Next round of lighting is attacking the windows. Today we approved the Press Release on the book. Still not allowed to promote it until the Publisher puts it on sale. The Web Site will not be up until then either. No point, he says, in wasting good contacts when they cannot be capitalised on-by a sale! I’m with that. Aside from the very interesting business of writing in the first place, there is a certain charisma about getting paid to do it! I mean – *Money* How was that song? “Money! It’s a drag. It’s the root of all evil!” (Pink Floyd) I’ll never forget Menchie Moran either. Despite AEG assurances they were going into ‘quiet time’, we got correspondence from the artist assigned to DARK – Me3 and went ahead with finalising the Cover Art. As of virtually Christmas Day, the Print Proof of the book is on its way via UPS mail and should be here within two weeks. Once the book has been sighted, proof-read and approved by the author, it goes to Print and it also goes to all the other rigmarole of getting it seen and heard of and actually into people’s hands. The Publisher assures me they will offer constant assistance and guidance with the Marketing aspects and from this, we intuit he will be looking for shekels to grease the cogs of the Publishing Industry. We already funded an ‘Enhanced’ Public Relations package, which will promote the book on a ‘wide range’ of markets, as soon as we have approved the Print Proof copy. The term ‘Enhanced’ means they will use promotional art derived from the Cover Art and information about the author. This rather than simple text-only alerts throughout the publishing industry. We shall see what we shall see. The text-only advice would have been at no cost but we felt an illustrated package was more useful and cost little, given it may be crucial at this early stage of Marketing the book. So, surprisingly, it’s been all go despite the rest of the publishing world being in quiet time. As of 21st. November, the publisher is in ‘quiet time’ meaning only a skelton staff over the Festive Season, as not much typically gets done in publishing this time of year. Would have liked to have the Cover Art decided and even the Print Proof copy of the book but I guess AEG decided to hold it all till the new year. The book would not have reached the shops by Christmas 2010 anyway so this gives a clean run-up to the 2011 Market. We are not permitted to promote the book locally until it’s on sale-a big no no! We would expect the e-book version ultimately will sell more copies than the paper print but in anycase, it will need to be promoted. Nothing happens fast in this business. Except, of course, the Fatwa if you make it. We continue to get mentions in despatches. Today the publisher needed to confirm the correct address to send the Print Proof of the book, which will not be sent anyway for some weeks yet, we believe. That was quick! We now have the 2nd Revision in hand. It has all the corrections done that I picked up the first time around. I added one arbitrary point while verifying the first set of revisions was implemented exactly as I instructed. They were but I will still take a very close look at the entire book one more time. To me, it looks ready for print, aside from that one very minor point. I do feel impressed to look though, because it’s obviously me who must find errors-not the Publisher. From this point in, after the 1st Revision, I can make 20 changes and then, any more than that, I pay! I like the way it’s coming along. So now the edited copy of the 1st Proof has gone back to the publisher. Also the signed off version of the Cover Jacket Text. The actual artwork for the cover is still in stealth somewhere. Each time I mention that subject I get images of smouldering fingertips. I did send some graphics and a bit of instruction about what I felt they should do in that department so, yeh. At this point we are waiting to see the 2nd Proof of the book. It’s in pdf, equivalent to e-book format right now and preconfigured for kindle size documentation. Once the book is in approved status, so I gather, they will designate someone to deal with the Cover Art and the Promotional Material. Somewhere in there also, at a specified stage in the progress through production, a key will turn and the Publisher will create a Web Page, for me the Author and for the book, DARK – Millennium 3. I have other books, so if I stick with this publisher, I guess I would flog them at the same Web Site as DMe3. Last week was intensive. Proof reading the book AND confering on a suitable jacket text. This week will probably be quiet, while the publisher sorts out where they are at and where they want me to be. As of today we have the Author Biography submitted, some graphics Concept suggestions sent and the manuscript now in the hands of the Proof Manuscript Production Team. Yay! Information on the book coming, including graphics. It will be interesting to see the final artwork, even for me!